The six-eleven match-up provided the closest contest of Worcester’s first round play. Freetown Christiana jumped out to an early lead, but Worcester took command of the game in the second half with its intimidating front line. The ’95 New Year’s Run version built a lead and looked to be cruising towards a comfortable victory, but the international favorite, hailing from a barn within a squat in Copenhagen, strung together some stops and scores over the game’s final two minutes, pulling the rug out from under Worcester and moving into the round of 32. 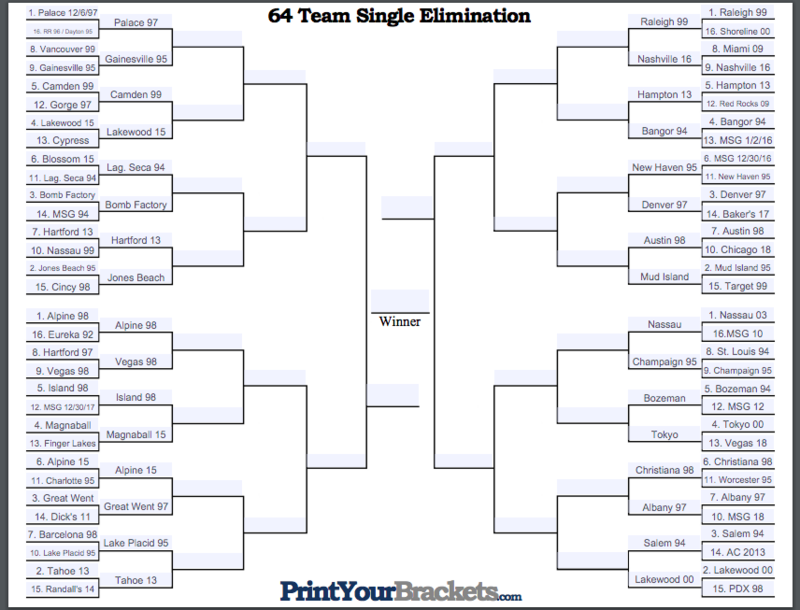 The eight-nine game gave the region its second-closest result, as Champaign edged the Fox Theatre version by only four votes. This contest was neck and neck throughout, as neither squad built a significant lead. Champaign fell back on its well-loved, Fall ’95, arena-style offensive to hold off the upstart, emotional version from a year previous. Champaign’s win makes Fall Tour ’95 the top performing tour of the first round at 4-1. The Albany-MSG match-up dripped with drama, as the two New York versions engaged in a back and forth slugfest featuring multiple lead changes. Surprisingly, MSG had the lead for a large chunk of the game, but the the thick cowfunk of Albany proved too much to handle for the modern, bluesy-bliss-anchored rendition. It takes more than a little peak to bring down a giant of Fall ’97. Albany joins its tour brethren, Auburn Hills and Denver in the next round. The mega-version from Bozeman put the stomp down on MSG’s 2012 outing in a game that was never competitive. MSG, a strong version in its own right, was the victim of a tough draw in this one, as Bozeman was a lock for round two from the get go. The far-eastern juggernaut clobbered the most recent Halloween version with its exploratory style and Japanese stylings. The hard-hitting, classic-sounding, post-Kasvot rendition tried to put up a fight, but its defense was creatively overmatched by in this lop-sided defeat. Following the Worcester region’s upper-seeded blowout trend, the famed version from Salem ’94 ran circles around the hugely-underrated outing from Atlantic City ’13. Nobody expected AC to compete with one of ’94’s hallmark Tweezers, as Salem has its eyes set on the regional final and beyond. AC will live to fight another day, and would have had far more success had it headed for the NIT. Though this result was never in doubt, there were times throughout the contest that Portland creeped up on Lakewood, providing the favored version with a bit more than it bargained for. Perhaps under-seeded, Portland fought valiantly, employing dubbed out rhythms and hip-hop teases in an attempt to pull the upset, but Lakewood never gave up the lead, coasting to a ten vote victory. Almost every media member had Nassau in their pre-tournament Final Four, and the post-hiatus monster looked every bit the part in annihilating 2010’s MSG offering. Nassau has all the pieces in place, and has the look of a version that will make a deep tournament run. This game was merely its warm-up. The first round has concluded! The first half of the second round will be posted within 24 hours in its own post. This entry was posted	on Friday, April 12th, 2019 at 10:16 pm	and is filed under Uncategorized. You can follow any responses to this entry through the RSS 2.0 feed. Both comments and pings are currently closed. Cool breakdown of trends, @miner. Though the observation is solely via Tweezer and constrained to the first round, it is interesting to see summer 2015 hanging tough with fall 94, 95, and 97. That indicates two things to me: (1) Tweezer’s status as an all time jam vehicle, even with ~20 years’ worth of jammable material added to the catalogue, and (2) 2015 was a special year of music. I’m not trying to make a 1.0, 2.0, 3.0 debate in any way, but it is notable that summer 2015 showed up with some of the best in the first round. Some spicy matchups coming in the round of 32. Nashville ’16 taking down Miami ’09 still has me scratching my head a little bit. Summer 2015 was the heat. No doubt, Rooster. Not once in this post do you even mention that this is a Tweezer-off. In the description of Salem/AC it’s clear, but this post won’t hold up well without any context. Still, really fun to see this play out!